Looking for an all-ages, all-skills route for your next run, walk, or bike ride? If you’ve not yet checked out Gig Harbor’s five-mile Cushman Trail, now’s the time! The Cushman Trail is a paved community trail that will keep your interest and adrenaline pumping along its undulating hills and changing vistas. It’s as much of a workout as you’d like to be, depending on which parts of the trail (or all of it) you take advantage of. Like hills? A roundtrip between the trailheads on 14th Avenue Northwest and Borgen Boulevard climbs nearly twice as many vertical feet as a round trip on the similar Foothills Trail (from Puyallup to South Prairie), even though it’s less than half the distance. In some places, the Cushman Trail has a grade of 10 percent. That being said, the trail is accessible to walkers of all ages and skills, and hand rails and benches are found at many spots along the trail (as well as restrooms, five to be exact). The trail has a difficulty rating of 3 (5 is most difficult; 1 is easiest). If you do the whole thing and back, you’ll travel 12.4 miles round trip with an elevation gain of 800 feet along the way. The trail is 16 feet wide with four-foot-wide gravel shoulders. Dogs are permitted on leash (and please clean up after them!). For cyclists, the Cushman Trail can easily be linked with Tacoma’s Scott Pierson Trail, which adds a scenic trip over the Tacoma Narrows Bridge. To access the Pierson Trail from the Cushman Trail’s 14th Street trailhead, head south to 24th Street and turn right. From there, locate the Pierson Trail on your left after crossing State Route 16. There is no toll for crossing the bridge by bike. Summertime is a great time to get out and take advantage of the beautiful weather and views around Gig Harbor. 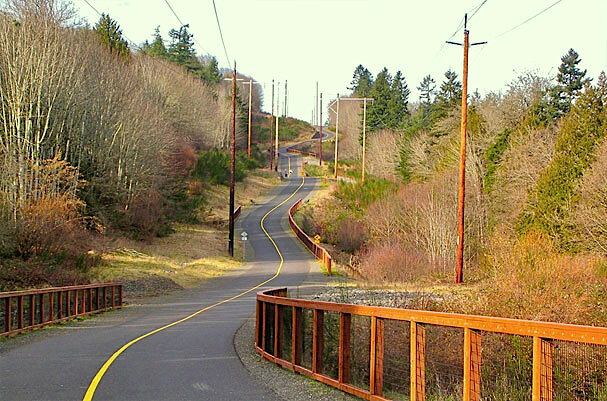 Check out the Cushman Trail, get some exercise — and enjoy! DIRECTIONS: To reach the 14th Avenue Northwest trailhead, take the 24th Street Northwest exit from State Route 16 and turn east. After one block, turn left on 14th Avenue and drive north for half a mile. The trailhead will be on the left.